Exotic activities like swimming with dolphins, bird watching and hiking in the desert are within your reach with a Club Hotel Eilat timeshare near the Red Sea in Israel. Enjoy the beaches of Eliat which face the Red Sea, with calm, serene waters delightful for swimming, boating, waterskiing, fishing, sailing and scuba diving. Partake in activities like horseback riding and tennis nearby. You will also find restaurants, bars, nightclubs and enchanting shopping opportunities with your decision to buy one of these Israel timeshare resales. Fun playgrounds and a state-of-the-art water park on the grounds of Club Hotel Eilat delight families, while nighttime Las Vegas-caliber entertainment provides even more thrills. Spacious suites give everyone room to fully enjoy themselves. Suites are air-conditioned, have full kitchenettes with microwave oven, small refrigerator, kettle and cutlery, two televisions, free Wi-Fi and a relaxing private balcony with city or mountain views. Make a light meal and enjoy the splendid view from your balcony for a relaxing evening, or go out and experience electrifying entertainment offered by your resort. Your option to buy Israel timeshare resales comes with benefits everyone will love. At your resort, you will find an amazing water park featuring seven swimming pools for children and adults, incredible waterfalls, fish ponds, Jacuzzi pools and tanning areas. Enjoy having an exercise room to use, saunas with massage services, restaurants, bar, game room, handy convenience stores and an entertainment club tailored for children. A nearby underwater observatory called Eilat Underwater Observatory Marine Park is found near Club Hotel Eilat. Here, visitors can see stingrays, sea bats, walruses, a new shark's world exhibition and take glass bottom boat rides. Gliding along watching the mesmerizing sea life underneath your boat is an incredible way to spend a sunny afternoon. Exciting new memories are waiting to be made at this gorgeous edge of the Red Sea, in the fascinating resort town of Eilat, Israel. Whether you capture these memories with a camera or in your heart, this area stays with you always. 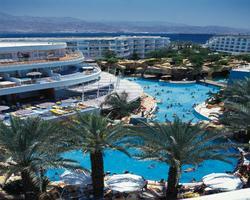 Contact Club Hotel Eilat Specialist Today!